Kentucky Fried Chicken | Simple and Delicious ! This recipe is from Kairali TV fame Mrs.Lakshmi Nair's Magic Oven. 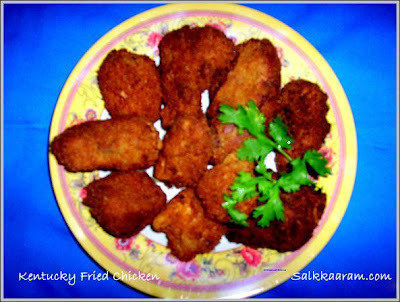 Though this chicken fry doesn't have the exact taste of real KFC, it is a hit among kids. Heat a kadai and add the chicken pieces, tomato sauce,soya sauce, chilly sauce, garlic & ginger pastes,pepper powder and salt. Add water, cover and cook for approx. 10 minutes (till the chicken is 3/4 th cooked). Put off the stove and remove chicken pieces and keep aside the stock. In another bowl make a batter of maida, salt, pepper powder, haldi(turmeric), beaten egg and water . Mix with hand for a loose batter. Take breadcrumbs in another plate. Dip the chicken pieces in the batter and then roll it on breadcrumbs till well coated. Deep fry the chicken pieces till crisp and golden brown. In another pan heat the stock again, when boiling reduce flame and add the corn starch (add ¼ cup water to 2tbsp of corn flour). Use this stock as the gravy and serve it in a bowl separately. The stock is very tasty so instead of discarding the same can be used as a gravy or soup and can be served along with the fried chicken and may be toasted bread. Thanks rv, I liked yours too..Keep visiting, here all dishes are simple..and most of them from my mother.. I have posted a Malayalam to English and Hindi to English glossaries here. Did you see that? It is one the right side bar, under Labels section..
i have made it,it was very nice.since iam living in dubai i used to get KFC from shop.here after i can prepare from home itself. This is wonderful, KFC from my kitchen..I like it! I like collecting various kinds of recipes. Your recipes seems delicious.......have a chance to test it. Thanks for sharing. I love KFC. I like their fried chicken and gravy. Hope this recipe would taste the same as what I like. Anyway, thanks for sharing this. Hope you can add up recipe for gravy. Yes our family love really a KFC the chicken is very delicious and fresh you can see that the chicken is very tender juicy.....Love it....I think I am hungry now!!!! and it's allways fun to come back.